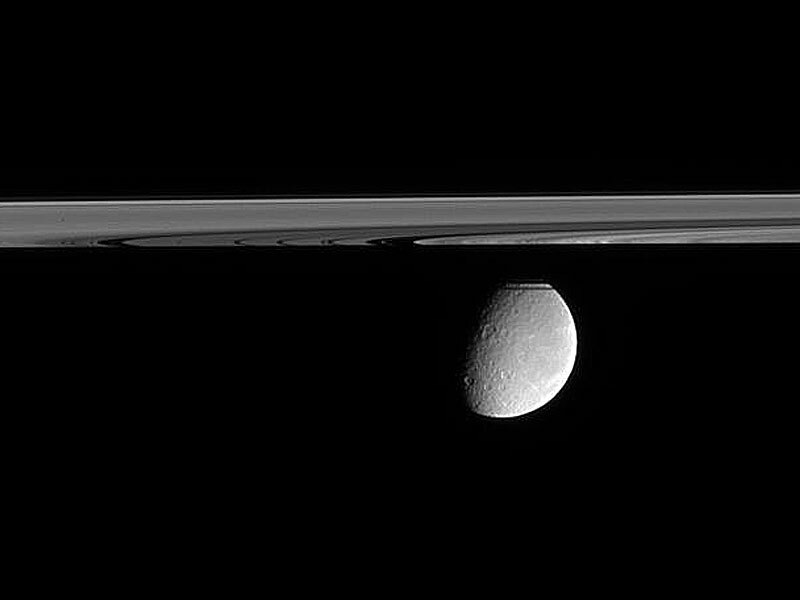 Explanation: When orbiting Saturn, be sure to watch for breathtaking superpositions of moons, rings, and shadows. One such picturesque vista was visible recently to the robot Cassini spacecraft now orbiting Saturn. In late February, Cassini captured Rhea, the second largest moon of Saturn, while looking up from slightly beneath Saturn's expansive ring plane. Signature dark gaps are visible in the nearly edge-on rings. A shadow of Saturn's F ring cuts across the cratered ice-moon. Cassini is scheduled to continue sending back images from the orbit of Saturn until at least 2008.